Sindh may be changing the examination and vacation schedule for schools. 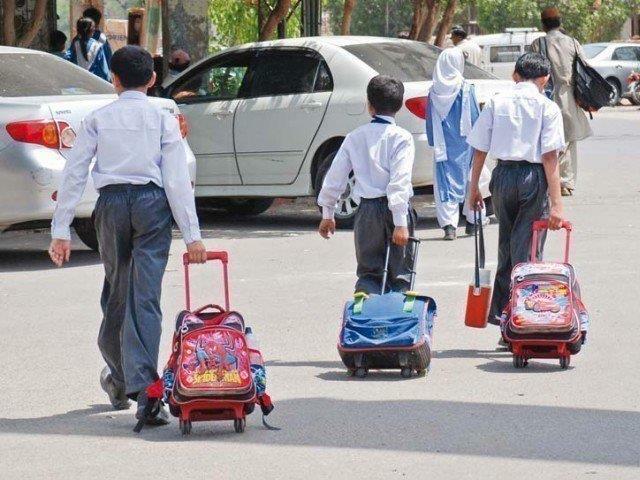 A steering committee decided on Wednesday that summer vacations will start from May 1, instead of June. It agreed that the exams should be held from March 20 to April 30. Children won’t get days off on various public holidays anymore. There will be no holiday on Kashmir Day, Independence Day, the Urs of Shah Latif, Pakistan Day, Eid Miladun Nabi, or Quaid-e-Azam’s death anniversary. Schools will hold special events on the mentioned days to commemorate them instead. The committee is currently debating school timings. The steering committee will present these suggestions to the government, which will then decide if it wants to implement them. This is the first time a sensible decesion has been made.hope it’s implemented. Literacy rate does not rise up when you cancel public holidays. One is shocked to know that currently Sindh is undergoing an educational emergency , what a useless joke it is. It’s a total monopoly of the school authorities and board officials when it comes to rampant cheating in exams . Bribes in lacs are taken by board officials in entire Sindh (sukkur, larkana, m.khas, Hyderabad boards) except Karachi where it exists to a limited extent. Very soon the exams are over and bribes are handed over to the concerned agent of respective board. Even if the paper is left entirely empty by the student, given that he/she has paid the amount in board, the student would get the same % as communicated at the time of the deal. starting from the Top authorities, and ending on a peon or computer operator of board, everyone concerned is involved in this blatant educational corruption leading to overall failure of Sindh in education. For one year experimentally, govt should hire British Council or request IBA for the conduct of 9-12th board exams in Sindh, and the results will shock everyone and will clearly show where actually Sindh stands in education. . I this right decession . 9/10 Moharram holidays are not mentioned in this news. On 9/10 Moharram schools should be opened and students should know importance of 9/10 Moharram. Sir please implement the free adjustments of June July 2018. As per the orders of honourable chief Justice of Pakistan. No actions had been seen since it was orders. What about June/July fees ???? This decision should be for one month due Ramdan and as well as on trial basis, but in my personal opinion it will not be successful for future. All of many students will go into physico. The schools should be closed near the end of June and opened in the beginning of September because it makes more sense. This decision of having the holidays from 1st May is just an eyewash to cover the period of Ramadhan which falls on the 6th of May. The educational system in Sindh is unique from all other take the example of having only five subjects taught in 9th class and the remaining five in 10th class. Is this some kind of a joke . In the rest of Pakistan even a province like Baluchistan students study all 9 subjects in both 9 and 10 to be able to keep the students engaged and have practical knowledge and command over all subjects. But it seems the steering committee is playing havoc with the lives and future of the children to make it easier. Countries all over the world have progressed and introduced more to feed the children in education but here we are even removing all traces of whatever education is left in us. The Steering Committee should be dissolved and a new Committee set up with proper intellects who know what is best for the children and not vice versa. This is not sensible move because this is given relief to schools that they receive June & July fee against the order of Supreme Court of Pakistan. This PPPP government is pain [for] Pakistani people’s and they won’t to given any relief to public just because of their bribe parcels who they get from private schools.